Cream shortening with sugar, add egg and molasses, beat well. Sift together flour, baking powder, salt, ginger, cinnamon. Add flour mixture; beat well. Wrap in waxed paper; chill. Roll out 1/8 inch thick on lightly floured board. Cut dough with round cookie cutter about 2 inches in diameter. On bottom part of cookie, place about 1 teaspoon of filling, with a little of the liquid portion. Slash top of cookie to about 1/2 inch from sides. Pull back and place over bottom part and filling. Bake at 375°F. for 10 minutes. Makes 3 dozen filled cookies. We like mincemeat. I personally don’t go in for the traditional British mince (finding bits of meat in a fruit pie bothers me, although Buzz thinks it’s fun), but it’s not hard to find vegetarian, fruit-only options around. So this week we’re putting mincemeat back in a pie, but a very fluffy pie — a mincemeat chiffon pie, in fact. Sprinkle gelatine on water to soften. Place over low heat, stirring constantly until gelatine is dissolved. Remove from heat and stir in rum and mincemeat. Chill in refrigerator or in bowl of ice and water, stirring occasionally, until the mixture mounds when dropped from spoon. Beat egg whites until stiff. Beat in sugar and salt. Fold gelatine mixture into stiffly beaten egg whites. Fold in whipped cream. Turn into a baked pie shell. Garnish with Maraschino cherries, and chill until firm. This is a page from Knox On-Screen Recipes, a cookbook I’m actually quite curious about — is it just pretending to have screenshots of steps of a recipe, or actually from a gelatin cookery show? I’ve always associated mincemeat with pies. Buzz loves making mincemeat pies… and I love eating them. But now, we’re doing “mincemeat swirlybuns”, which apparently is the way to break mincemeat out of the dessert category and put it in breakfast instead. Divide dough in half. On floured board roll one half into 18″x9″ rectangle. Spread with half the Mince Meat filling. From 18″ side roll up as for jelly roll. Seal edges. Cut into 1 1/2″ slices. Place in greased muffin cups, cut side up. Repeat with rest of dough and filling. Cover: let rise in warm draft-free place until doubled, about 1 hour. Bake at 350°F. 20 to 25 minutes, or until done. Frost with confectioners’ sugar icing while warm. Makes 24 beautiful buns. Just add a can of tomato soup and some cheese and DINNER IS SERVED. Make a Turkey Divan with rich, red Tomato Soup to keep up the holiday spirits. In a saucepan, cook 1/4 cup chopped onion with 1/2 teaspoon crushed oregano in 2 tablespoons butter or margarine until tender. Add 1 can (10 3/4 oz.) Campbell’s Tomato Soup and 1/2 soup can water. In shallow baking dish (10 x 6 x 2″) spread 1 1/2 cups prepared stuffing; top with 4 servings sliced, cooked turkey. Sprinkle with 1/4 cup shredded mild process cheese. Bake at 450°F. for 15 minutes or until hot. Too Many Turkey Leftovers Friday The day after Thanksgiving is coming up quickly. This month, I’m going to try to feature various ways that you might be able to use up some of all that extra turkey that you will invariably have in a few weeks. S-t-r-e-t-c-h those holiday leftovers into an exciting one-dish supper. Prepare 1 1/3 cups Minute Rice as directed on package, adding 1/8 teaspoon savory. Cook 1 package Birds Eye Broccoli Spears or Cuts as directed; add 2 tablespoons butter. Mix 2 cans condensed cream of chicken soup, 1/2 cup milk, 2 diced pimentos, a little chopped parsley, and 1 1/2 cups diced leftover turkey, chicken, or other fowl. Mix well, season, simmer 3 minutes to heat and blend flavors. Arrange on platter, and serve 4 or 5. On large baking sheet pat pastry into 11″ circle. Pierce thoroughly with fork. Bake in 425°F oven 8 minutes or until lightly browned. Cool. Place on serving platter. Beat next 4 ingredients until fluffy; spread evenly on pastry. Cover; chill at least 4 hours. Garnish as shown just before serving. Makes 12 (2 1/2″) wedges. 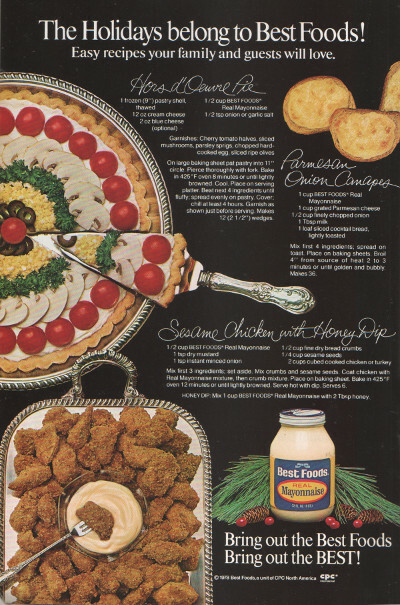 My daughter is usually not enthusiastic about retro recipes… when she needs to eat them. But when she came across this advertisement in an old National Geographic magazine, she ran to me right away. Mix first 3 ingredients; set aside. Mix crumbs and sesame seeds. Coat chicken with Real Mayonnaise mixture, then crumb mixture. Place on baking sheet. Bake in 425°F oven 12 minutes or until lightly browned. Serve hot with dip. Serves 6. This was going to be a fun cake recipe. And then there was a flood. So it’s still fun, but it’s also bizarre and memorable. If you are want to donate to support South Carolina flood victims, the South Carolina Emergency Management Division has a list of organizations that are working in the state. I’ve mentioned a few times before that I like making cakes from scratch. There’s a lot of work involved, and so many ingredients and bowls and utensils — don’t get me wrong, I totally understand why boxed cake mixes were invented, and why they’re incredibly popular. But sometimes it’s great get back to basics. This used to be the only way to make cake: butter, eggs, flour, and perhaps some chocolate. And people could be really judgmental about making cakes, too. 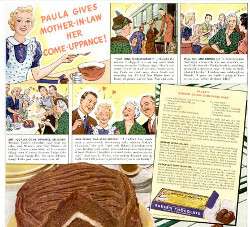 There’s a whole story in this Baker’s Chocolate advertisement about Paula and her mother-in-law — and in the end, Paula’s amazing cake is what gets her accepted by her new family. Sift flour once, measure, add baking powder, soda and salt, and sift together three times. Cream butter thoroughly, add sugar gradually, and cream together until light and fluffy. Add eggs, one at a time, beating thoroughly after each. Then add chocolate and blend. Add flour, alternately with milk, a small amount at a time, beating after each addition until smooth. Add vanilla. Bake in two greased 9-inch layer pans in moderate oven (350°F.) 30 minutes. Spread Golden Cream Filling between layers and Chocolate Fluff Frosting on top and sides of cake. I was going to post this cool chocolate cake recipe. Cake, filling, and frosting all from scratch. Delicious. I baked the cake part Saturday, and then I couldn’t get it out of the pans. And then we got a 200 year rainfall event. This is one of the roads leading out of my neighborhood. And I was thinking to myself, hey, no problem. I can still cook. But then they shut off the water. Which is realistically good, because the water mains are all in terrible shape and everything is contaminated. However, I can’t wash my dishes. And this cake takes, like, four bowls and all sorts of whisking and utensils. So the good news is, we’re totally fine. We’re on a hill, our house is dry, we have emergency supplies to get us through and plenty of peanut butter for sandwiches. We are much better off than many of our neighbors, both nearby and across the state (and indeed along the East Coast, but my Facebook and news feeds are a bit biased right now). The bad news is, there’s no cake.